While I have been generally skeptical about the ability of academic psychology to deliver deep truths about human functioning in a complex environment, two books I have been reading have shown me that there is some wonderful work that can be done within the rubric of psychology that has the potential of changing the way we see ourselves, make decisions, and take action. The current bestseller Thinking, Fast and Slow by psychologist and Nobel prize winner Daniel Kahneman and The Emotional Life of Your Brain by Richard Davidson show us that some of what seem to be the mysteries or paradoxes of human behavior may have a clear explanation and, more importantly, lead the way to human beings being able to exercise control and compassion for the more primitive manifestations of their behavior. In addition, these volumes are noteworthy as they contain the reflections on how the authors came to do the work they did; the ways that they developed their insights over many years of challenging observations and very good work; and being able to go against conventional wisdom and even counsel from other professionals that they were on the wrong track. Both books present full models of aspects of how we work as humans, based on observations that are deeply empirical and verifiable. Both books move beyond common knowledge about the brain—left and right hemisphere; the limbic and cortical systems. Each of these had some validity and sounded reasonable as ways to look at the complexity of rational and emotional behavior. But these constructs remained theoretical and were hard to track and use practically. Davidson tells about beginning his studies at Harvard in the 1970s where a group of graduate students, including Dan Goleman, began to meditate together and wonder how they could harness and demonstrate the clear experience they had of it being something special. His work, discouraged at first, was to find out how to measure emotion in its manifestation in the brain. He used early brainwave technology and has been blessed with new technologies that enable him to do more and more subtle scans of the brain. What he adds is a clear focus; a deeply empirical mind closely observing people having all sorts of emotional challenges; and, finally, an ability to build a clear, empirical and practical system developed during the course of many years. He has been able to demonstrate that emotional functioning can be traced in the brain and can, therefore, definitely map a core set of emotional responses. He has focused his work less on the negative emotions—anger, fear, and sadness—and moved to look at the positive emotions. 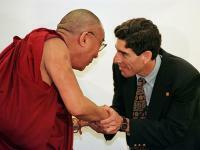 In doing this, he has fulfilled a personal pledge to the Dalai Lama to look at the role of positive emotional states. Davidson has shown that meditation can help people attain control over their focus of attention and some of their automatic emotional responses to stress. From his work, he has come up with an empirical, demonstrable “map” and tool to define six emotional states. Not trying to push aside other emotional models, he shows how his model maps to the popular five-trait model of emotional and personal styles, and how each of the elements in his model can be modified by training. Kahneman tells of a similar journey. His work on behavioral economics has shown that the rational model that is the main premise of human economic behavior is a nice idea, but does not really link to the actual way that we make decisions about money and other important life choices. His work offers a clearly developed upgrade and clarification of the various dual theories of the mind. His model, called simply Systems I and II, are two systems by which people make decisions. System I is instinctive, automatic, easy and natural, but with several systemic flaws. In the world of complex, non-sensory data that is difficult to analyze, System I is not a good guide. It prefers and remembers emotionally-linked experience when harder and more rational study could lead in another direction. Kahneman shows how various common thinking errors lead to various economic disasters, both personally and systemically costly. His ideas, leading to his Nobel prize, have challenged many of the core elements of economic behavior, leading to a different way of looking at financial markets and market behavior, that we have all begun to learn from. So Kahneman and Davidson are the kind of psychological scientists that are our current era’s successors to Maslow and Rogers even though their work is more systematic and data-based than those of the great experiential theorists. In our current day, their careful example is able to bring out the best of scientific psychology in service of practical issues that, as the earlier humanists did, make us look at the world differently and offer us practical paths to harness some of the self-defeating elements of the human being.